With less than a week remaining before we are introduced to the winner of the renowned Deutsche Börse Photography Prize 2015. Predictions are still pouring in and opinions are shared from far and wide. Everyone wants to see their favourite photographer win and the shortlist has kept art circles and media talking since the announcement was made late last year. South Africa is home to two of the nominees, Zanele Muholi for her photobook Faces and Phases 2006-14 and Mikhael Subotzky who collaborated with UK’s Patrick Waterhouse on a book that focuses on Ponte City in Johannesburg. The shortlist also features Viviane Sassen who is nominated for an exhibition titled Umbra, held at the Nederlands Fotomuseum, as well as Nikolay Bakharev, a photographer in his 60s, who captured Russian bathers in the 80s. In the 18 years of the competition’s existence, this is the first time that an African and a South African female is shortlisted. Muholi emphasises that this nomination is a game changer and will open doors for other photographers and artists who are members of the Lesbian, Gay, Bisexual, Transgender and Intersex community. The prize was established by The Photographers’ Gallery with the aim of promoting contemporary photography and was first known as Citigroup, while Deutsche Börse has sponsored the £30,000 competition since 2005. Born in Durban KwaZulu Natal, Muholi is a visual activist, advocating for the lives, rights and safety of the LGBTI community in South Africa; with a specific focus on black lesbians. Having embarked on a journey of archiving and documenting the lives of LGBTI people in her surroundings, she was able to produce a publication from her lifetime project of black and white portraits of African lesbians and transgender individuals. Faces and Phases participants have fast gained a reputation for their ability to confront the camera. 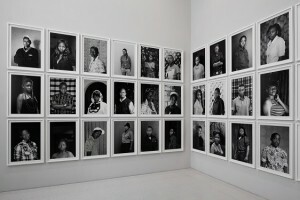 Muholi has also become the second black female (from four female nominees) after Lorna Simpson from the USA, to be a shortlisted recipient of the prize. 2010 was the first and last year to be dominated by females, and the only year won by a female since DB took over the prize. On May 26, two days before the DBPP ceremony, Muholi will host her much anticipated conversation with Bidisha, from the BBC Arts. This multi award winning South African has received many astonished reactions from London based artists, especially those with Caribbean and African roots about her exhibition, talk and nomination at the Photographers Gallery. Muholi’s work focuses on Post-Apartheid politics of the LGBTI community. 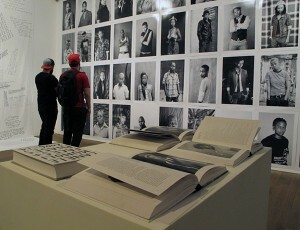 She stresses the fact that her work is concerned about creating a historical document that makes this community visible. Identifying as a black lesbian herself, Muholi’s work shines a light on both the love and tribulations experienced by members of her community. Maintaining her cool composure, she insists the nomination is not for her alone, but includes participants featured in her work. 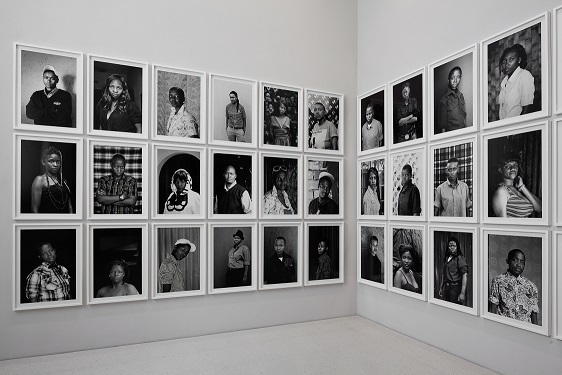 Muholi returns to London after opening her solo exhibition titled, Isibonelo/Evidence at Brooklyn Museum in New York City and is open until November 1 2015. She is also involved with Look3, a summer photo festival opening on June 10 2015 in the US. Illustrations above: Exhibition view of works by Zanele Muholi at The Photographers’ Gallery, London; Self-portrait, courtesy of Zanele Muholi; Exhibition view of works by Zanele Muholi at Brooklyn Museum, New York.